Dicentra or ‘Bleeding Heart’ have amazing flowers and attractive ferny foliage. 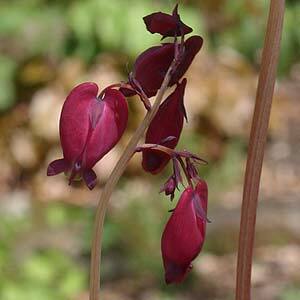 Dicentra spectabilis is the best known of this group of herbaceous perennials. With very attractive pink heart shaped flowers in spring, on long arching stems, they are an outstanding plant in the border or when left to naturalise under deciduous trees. This is where it becomes interesting, these plants have recently been reclassified, so D. spectabilis is now Lamprocapnos spectabilis. The reclassification is justified, as this is a species that does not run and spread, while plants such as D. spectabilis ‘Bucchanal’ will spread by underground rhizomes. Dicentra are a fascinating group of plants, with Dicentra spectabilis (syn Lamprocapnos spectabilis.) or Dicentra ‘bleeding heart’ being one of the star attractions. 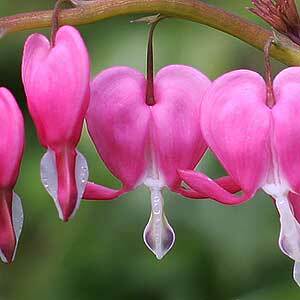 The flowers of dicentra resemble the shape of a heart, Dicentra spectabilis with its red flowers earns its name. The white flowered cultivar ‘alba’ is another great dicentra. Dicentra spectabilis ‘Bucchanal’ is an attractive red flowering ‘Bleeding Heart’. Over time it will spread to form a dense clump from spring through to summer. Lacy green foliage with crimson red heart shaped lowers rising well above. All Bleeding Heart Plants prefer a moist position, lots of well rotted compost or leaf mould, a semi shaded position is best. Keep the plants moist at all times and protect from snails. We grow ours in the shade garden as well as in glazed terracotta pots. We use a mixture of potting mix with water saving granules and rotted cow manure. When the they die down we place the pots in a shady cool place until the next season, and make sure they don’t dry out. Remember that these are a plant do not like being disturbed, so aways try to plant dicentra in a permanent position to avoid the need to transplant or try them in a large pot or container.